Manchester by the Sea is a simple film made from a rather simple story. Meaning that the narrative is straight-forward and wholly based in the everyday lives the majority of us tend to lead. While these factors certainly make it more relatable than say, something along the lines of Allied, which is technically based in reality, but from which we are so far removed at this point it almost feels not of this world. All of this is to say that in our current plane of existence, Manchester by the Sea feels personal. It is a movie that creates an authentic environment from the world in which it exists. It feels lived-in and to that point we are not necessarily welcomed as much into this halfhearted existence that comes to be the subject of the film as we are wedged into the ongoing crap show that literally and figuratively seems to make up Lee Chandler's (Casey Affleck) life. I find it best to go into most films without much of an idea as to what exactly one might be getting themselves into and while it may be difficult to do that in terms of major blockbusters when living in a world that offers teasers for teaser trailers it is with movies such as Manchester by the Sea where this practice can be exercised to its full effect. And so, I went in more or less blind to what Manchester by the Sea carried in terms of narrative and with only the buzz it garnered out of its Sundance premiere earlier this year to signify that it was one worth watching. No matter if one knows the basic premise or not though, one thing is for certain: one cannot know the whole of the story the film is telling and it is in how director Kenneth Lonergan (Margaret) sets up the present scenario for our characters to operate in and then how he slowly peels back the layers of each of their pasts helping us to understand not only why and how these people have become who they are, but also giving us a glimpse of how far they can go and what the future might hold for them that makes the experience so simultaneously simple yet equally involving. It's a powerful piece of human drama to say the least with bare bones emotions bleeding through on the face of Affleck and every other actor in any significant portion of the movie. Lonergan, as a writer, is clearly interested in digging into the psyches of those who have dealt in tragedy and analyzing the different ways in which we as human beings deal with such surreal, life-altering events. With Manchester by the Sea the writer/director tackles permanent heartbreak to grandly moving results. 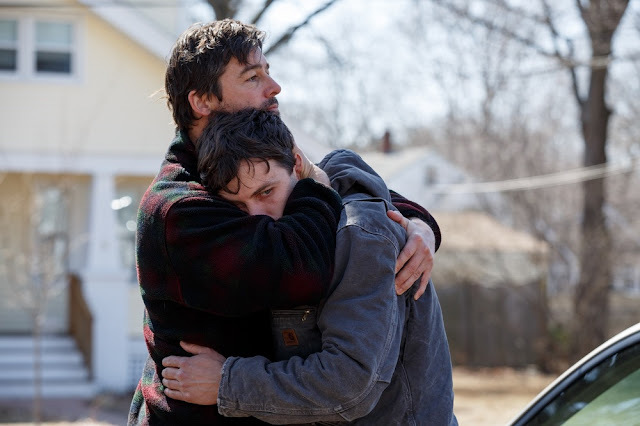 Joe (Kyle Chandler) and Lee Chandler (Casey Affleck) are brothers torn down by unrelenting tragedy. As said, we meet Lee Chandler as he is working day to day through several apartment buildings as a maintenance man in Boston. He sleeps in a small, single room apartment of sorts that is more or less the basement of one of the buildings he tends to. He doesn't require much to maintain his lifestyle and seems to be doing the work so as to keep his mind off other things. Lee isn't one for conversation. He isn't even intrigued when he overhears female tenants discussing how they are attracted to him or what they might do to have him notice them. Rather, Lee goes about his business and doesn't do much else besides sleep, watch sports on television, and drink beer. It's evident early on Lee (and pretty much everyone around him) drink to take the edge off of their otherwise stressful lives, but more times than not this ends up in some kind of confrontation involving Lee and his short temper. Change comes swiftly when Lee receives a call telling him his brother, Joe (Kyle Chandler), has died of a heart disease they've long known he had. Despite the fair warning Lee is naturally taken off guard by the news and undoubtedly somewhat regretful he hasn't been around or in the same town as his brother in recent years due to reasons not yet known to us. At this news though, Lee packs his things and heads to Manchester which is situated on the north shore of Massachusetts. Arriving home Lee learns that his brother has made him the guardian of his son and Lee's nephew, Patrick (Lucas Hedges), whom Lee has no interest in raising. We can glean from the actions of the deceased Joe (and even more so as the Chandler brothers past is revealed) that he has forced Lee into this predicament for a reason. Joe's ex-wife, Elise (Gretchen Mol), is out of the picture due to insanity whereas Lee has only moved to Boston for reasons of distancing himself from his past. As much as the film comes to be about the give and take dynamic that develops between Lee and Patrick and how these individuals who have each seemingly lost so much in their lives can help one another in gaining their footing back to some type of normalcy Manchester by the Sea is just as much about acknowledging that some things can never be fixed, that most things must be accepted, but that working through such pain rather than against it is what's ultimately best for the soul. What is unique about this film in particular though, is that it doesn't care to be artistically striking or largely inventive in any way, shape, or form. Moreover, Lonergan's directing style is that of something that is so subdued it relies solely on the story that is being told to move you, to emotionally affect you, to bring about moments that are beyond comprehension in what exactly they mean, but that you know are significant in more ways than your heartache can handle. This is both admirable while bringing into question just how much of a choice it is over inexperience. Lonergan, while a veteran writer, has only directed three feature films with Manchester being his first in five years. It's not that the film is sloppily shot or even that it feels amateurish in its compositions or execution, but more that it is simply competent in its technique. There seems to be little more to the way in which Lonergan has shot the film than simply having his director of photography set the camera up where they thought would be best and starting to roll. There is no visual reinforcement to the ideas or themes that are being considered within the text or dialogue. By keeping things on a basic level in terms of filmmaking Lonergan more or less allows his camera to become a lingering eye; deciding in the editing bay to let shots last just a little longer than we might expect and structuring the scenes in such a way that the ever-increasing pathos is elicited with each and every scene as they build on top of one another as more information becomes available. In other words, Lonergan keeps his framing invisible and his cuts so precise that what we're left to truly admire is the work of the actors with whom much of the heavy lifting automatically falls when telling a story of this nature. At the heart of this is Affleck's stunning turn as a man who we initially don't care for. We don't know Lee and we don't know why he is the way he is, but Affleck brings an assured yet closed-off exterior to this man who, as far as he's concerned, is no longer living, but simply existing. In smaller parts, Chandler, Michelle Williams, and C.J. Wilson shine in their quaint, but vital roles that play into what shapes Lee's perceptions of the world after losing his brother. 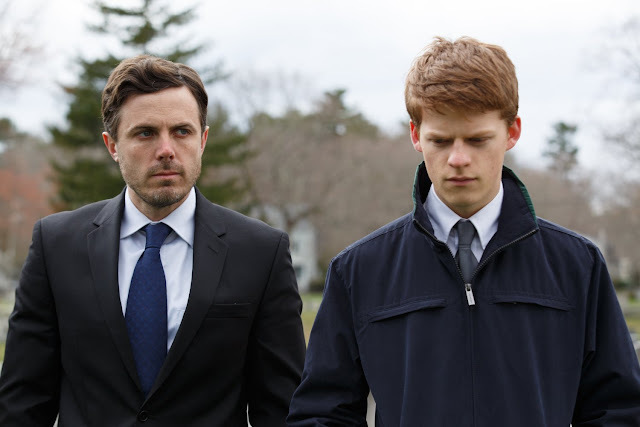 In the event of Joe's death, Lee takes guardianship of his nephew, Patrick (Lucas Hedges), in Manchester by the Sea. Affleck is a pro in this line of isolation for the sake of sanity. As such, these tendencies are only dismantled when he comes into contact with ex-wife Randi (Williams) and everything he has suppressed under this facade comes boiling back to the surface. In the two scenes Affleck and Williams share I don't know that I was able to pry my hands away from my head as the full ramifications of the weight of every word they exchanged washed over me in deep, deep heartache. These two scenes are by far the most beautifully tragic aspects of the film making it impossible to not submit one's self to the level of performance and raw emotion on display. I can't even imagine. Bringing around the structure of the film, as we come to learn the history of Affleck's Lee we come to see the character in a different light though Affleck isn't necessarily doing anything different as far as his performance is concerned. And yet, somehow he's changing and without making any major shifts in his actions we can see the light is a little brighter and the optimism a little larger. As the relationship between Lee and Patrick evolves from one of complete disdain for each another to that of Lee feeling a responsibility for the actions of his nephew and Patrick coming around to understand if not comprehend the full effect of what Lee has been through there comes to be slight alterations in the outlook each of these guys has on their life from that point on and obviously one another. There is brought up that "just enough" to keep them waking up the next morning, looking forward to what the day might potentially hold, and it is in this authenticity of the relationship between uncle and nephew that Manchester by the Sea earns its sly optimism despite being surrounded by shrouds of bleakness. As Patrick, Hedges is a fully dimensional teenager and not an archetype of any sort with his playful demeanor masking the torment of losing his loving father. This dynamic that is filled with concealed emotions and harsh judgments is one that grows to be that of understanding even if such understanding is never verbally communicated. 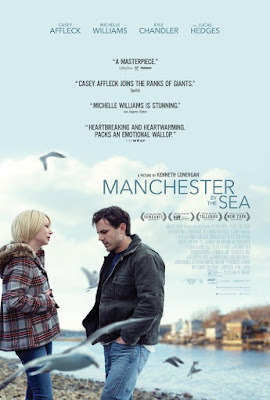 It is a relationship that mends as much as any permanent heartbreak can be mended and it is in this simplicity with which Lonergan acknowledges these complex and rather nuanced relationships that Manchester by the Sea draws its beauty.